-Sometime you may have trouble screwing the bottle of wine when having a date or celebrating an anniversary,it requires brute muscle to pull the cork out. But the design of this rabbit wine opener is based on classic lever and grip is accordance with human engineering, which will help you open the bottle easily. -It's perfect for gifting or having your own wine collection,3-piece wine tool set with nicely packing leave you an exquisite impression. 3.Grip the bottom neck firmly with the grip handles and slowly bring the lever up and return to closed position. 4.Keep a firm grip on the bottle neck with the handles and slowly lift the lever back to the open position. 5.Take the cork out of the bottle and repeat step 3& step 4 then the cork will be released from worm. 6.You can enjoy your wine or open another bottle. 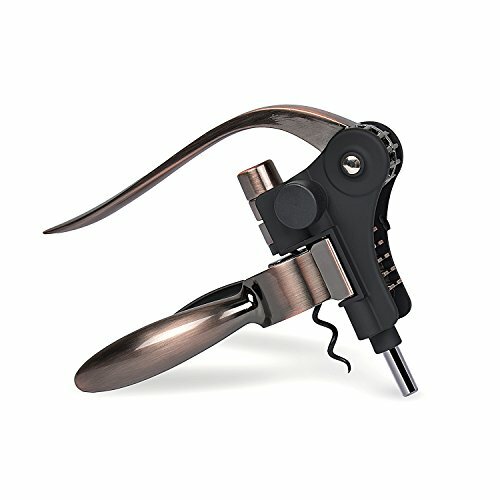 UNIQUE DESIGN & SOLID CONSTRUCTION: Vovoly Wine Opener is constructed of heavy-duty gorgeous zinc alloy material with copper plating stainless steel and ABS material, makes it more durable and attractive. ERGONOMIC LEVER HANDLE CORKSCREW: Vovoly Rabbit Wine Opener design is based on classic lever and grip, comply with the idea of mechanical advantage, comply. COMPLETE WINE SET: Including 1 lever-action rabbit ears wine opener, 1 foil cutter, 1 corkscrew spirals. IDEAL GIFT: Vovoly Bottle Opener beautifully packed in a luxurious black gift box. Ideal gift for Mother's Day, Christmas, Valentine's Day, ect. KINDLY NOTE: Please read the instruction manual on the box before using it. The sharp worm can go into the cork when going down and pull the cork out in a second when going up. If you have any questions about this product by Vovoly, contact us by completing and submitting the form below. If you are looking for a specif part number, please include it with your message.